This Stylish Black Trolley has multiple drawer sand plenty of space for your supplies and styling appliances. 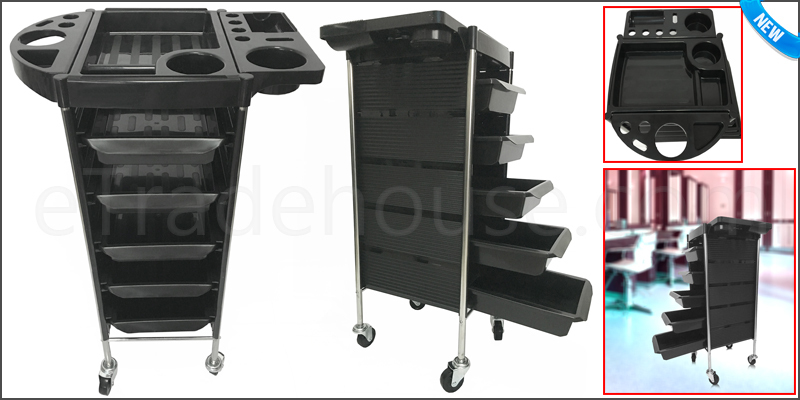 It is perfect for beauty salons, tattoo shops, pet groomers, nail technicians and other professionals who are looking for a feature-loaded utility cart with tons of storage and an attractive, accessible design. Four smooth-rolling, swivel casters provides superb mobility and allows the trolley to be positioned close to your working area for maximum efficiency. A perfectly designed trolle for salons. Removeable drawers make it comfortable to use. Plastic manufacture hence easily washable. To enhance work space, drawers can be fixed on the top side of trolle. Multi segmented top work space allow you to hold containers and other accessories. Fast and really easy to assemble.